Although most musicians are relatively familiar with chorus pedals, many do not know the basics behind their operation. The "chorus" name, itself, does help to reveal it's intended purpose....take an individual sound and make it sound deeper and thicker by reproducing it through multiple voices, or a "chorus". From a technical standpoint, a chorus pedal takes a signal, clones it, and then processes the "cloned" signal further. This processing, typically through a low frequency oscillator (LFO), is referred to as "modulation". Modulation is the varying of certain characteristics of the sound wave; these are generally the phase (timing), frequency (pitch), and amplitude (volume) of the sound wave. After this cloned signal is modulated, it is then added back to the original unprocessed (dry) signal with a slight delay, roughly 10 to 30 ms. 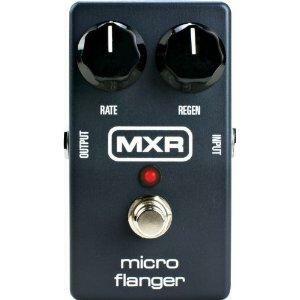 Chorus pedals are very similar to flanger pedals in terms of operation, although flangers tend to have shorter delay times. Almost all chorus pedals have delay, sweep/width/depth, and speed/rate functions. The delay function (button) sets the minimum amount of delay. In the case of a chorus pedal, we're talking 10 to 30 ms. The sweep/depth/width button controls the amount of change or modulation (over a certain amount of time) for the sound wave characteristics above. The higher the setting, the more noticeable the effect is. The speed/rate button works in conjunction with the sweep/depth/width button. If the speed/rate button is increased, the sweep/depth/width button will go through it's changes (modulation) faster. This is especially noticeable with a flanger pedal, where you can hear how often the airplane takeoff/landing sound regenerates. Additionally, you may see a "level" or "mix" knob on a chorus pedal. This generally adjusts the volume of the processed (cloned) signal in relation to the original signal.